Description: Rhizome usually stout, covered with soft, silky, pale and dark brown hairs. 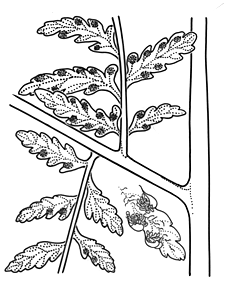 Fronds 0.4–1.5 m high, erect with drooping tips; stipe often mottled, yellow to brown above, darker below and at the base; lamina 3–4-pinnate, broad-triangular, pale green, lacy; ultimate segments asymmetric, usually deeply lobed with decurrent bases. Sori small, circular, marginal in 2 rows, each covered by a recurved marginal lobe; true indusium small and scale-like. Distribution and occurrence: Widespread in tall open forest, usually on poorer soils.